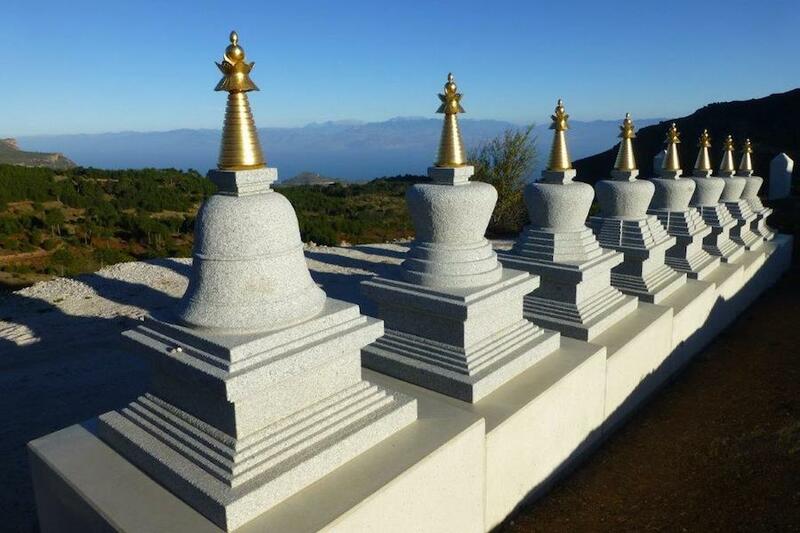 The year 2017 was a very auspicious one for Karma Berchen Ling and its International Sangha: Under the spiritual guidance of Lama Chogdrup Dorje, we built all 8 non-tantric stupas in one place. Everyone was invited to participate in preparation, construction and inauguration – and to share the blessing. Stupas (Tib. chorten) are Buddhist monuments, which express the nature of mind in a perfect way. They symbolize not only the Buddha state of “body, speech and mind inseparable” but also the entire path through the ten Bodhisattva levels until full enlightenment. Translated from the Tibetan “cho” means gifts and “rten” foundation; therefore a stupa is the foundation or perfect place for offering gifts to enlightenment. This leads to positive imprints in one’s mind – the one who experiences everything, and will lead to liberation and enlightenment. 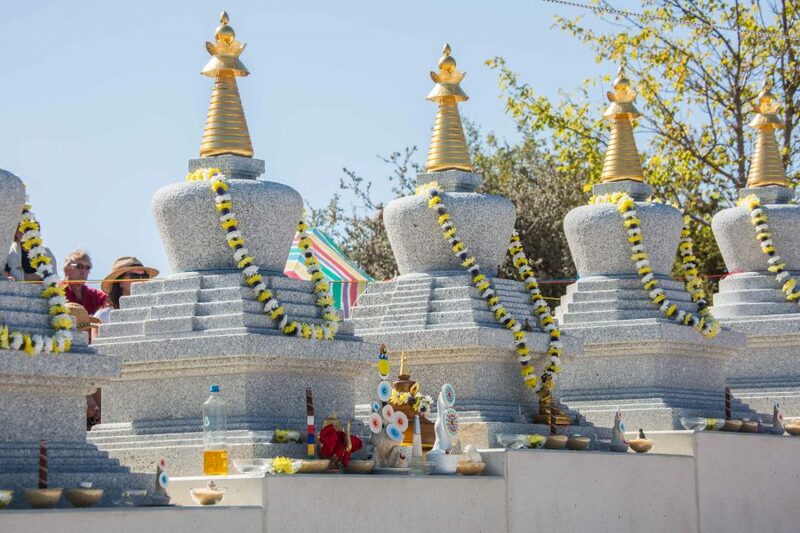 The stupa is a traditional architectural structure, filled with relics and written mantras, which shows the harmony and perfection of all universal principles and invites to partake in the development and endless possibilities of the human mind. Basically one can find descriptions of eight different types of stupas in the Sutras, the direct teachings of the Buddha. They refer to important events in the life of Buddha Shakyamuni, like his birth, his enlightenment, his teachings and his death. The first stupas of this kind were built at different places in India and today’s Nepal according to these events and became holy sites. Later, the tradition of the so-called “Tathagata Stupas of the Eight Sacret Places” came to Tibet. At some Tibetan monasteries you still find all eight stupas in a row on top of an enclosing wall, counting 108 or even 1,080 stupas all together. 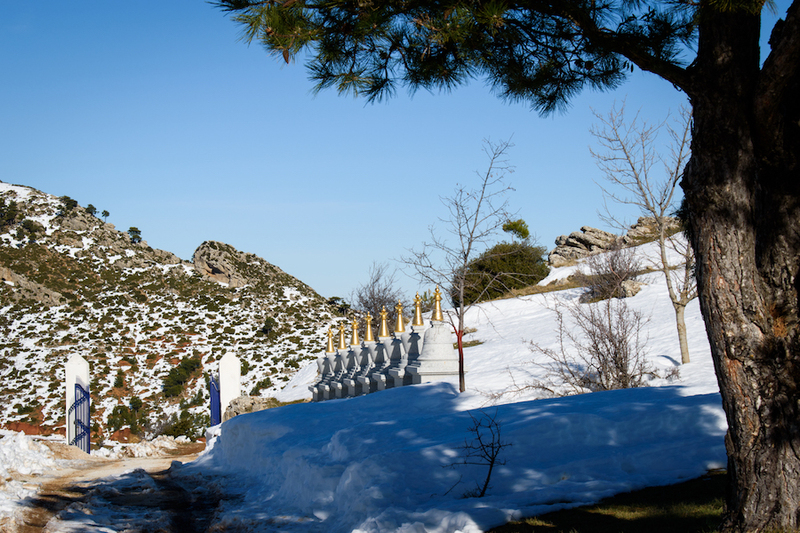 In Europe, all eight stupas built together are very rare to find. For example, one row is located in France (Montchardon) and since 2017, a beautiful set crowns Karma Berchen Ling. The eight stupas create a strong protective field which can keep away negative forces. Built at the entrance, this “wall of stupas” not only reminds us of the deeds of Buddha but also protects the retreat place outwardly. The main body of this stupa appears in the form of a lotus and symbolizes Buddha’s birth in Lumbini. This stupa symbolizes the full development of mind, the state of a Buddha. It was built by the Dharma king Bimbisara, honoring Buddha’s enlightenment in Bodhgaya. On the evening before reaching enlightenment, Buddha Shakyamuni removed the last subtle veils and obstacles in his mind, which is also represented in this stupa. This stupa represents the Dharma, the teachings of the Buddha about the way things are. It is also called “Wisdom Stupa” and was built on the occasion of Buddha’s first teaching “The four noble truths” which he gave in Sarnath/Varanasi. The stupa represents the threefold turning of the wheel of Dharma and contains all teachings Buddha gave. This stupa represents the miracles performed by Buddha when he converted the “followers of wrong views” (non-Buddhist masters) through his power of miracles. A person named Lisabi built this stupa in the Jetavana Grove in Shravasti. Buddha gave teachings to his mother in the heaven of thirty-three gods (Trayastrimsha Heaven). Buddha’s descent from this realm back to earth is symbolized by this special stupa with three ladders on each side. The first stupa of this kind was built in Samkashya. The cousin of Buddha named Devadatta had caused a split within the community of practitioners. To mark the reconciliation of the Sangha, this stupa was built in Rajgir. Shortly before his death Buddha extended his life for three months because his students asked him not to pass away. This happened in Vaishali. This stupa is also known for its healing power. This stupa symbolizes Buddha’s leaving the conditioned existence (death) in Kushinagara. The main body of the stupa has the form of a bell, and is a symbol for the perfect wisdom of Buddha.